Converts M4V to MP4 on Mac with simple steps and vice versa. Download and convert iTunes M4V to MP4 by pasting URLs on Mac. Record iTunes M4V files on Mac and save as MP4 format. Edit M4V videos with trimming, cropping, rotating, watermarks, effects, etc. Additional functions including GIF Maker, Fix Media Metadata, Video Compressor, and more. “MPEG for Video”, commonly known as M4V is a common file format used by Apple that comes under FairPlay DRM Copyright Protection by Apple. The format is used for encoding movies, TV shows, and music videos for iTunes store. Though M4V is quite similar to MP4 format since it comes with DRM protection, it can only be played on Apple devices like Mac, iPhone, and iPad. So if you have some of your favorite files in M4V format and you wish to play or edit them using non-Apple devices, converting M4V to MP4 on Mac is the most straightforward solution. Once converted, the files can be easily played over the host of other devices like Android, Xbox, PSP, and others. So, if you are looking for solutions on how to convert M4V to MP4 Mac, you are the right page. Read below to know more about the M4V to MP4 conversion process and tools. Convert M4V to MP4 on Mac without any loss of quality and vice versa. Convert M4V to MP4 or other 1,000+ formats including MOV/MKV/AVI/FLV/WMV/MPEG etc. Download and convert iTunes M4V to MP4 by pasting sites URL. Allows recording online videos and converting to the desired formats such as MP4 and M4V. Burn M4V to DVD on Mac with free menu templates and playback on any playable devices. Built-in video editor allows editing and customizing videos as needed. Conversion speed is 30 times faster as compared to other software, thanks to APEXTRANS technology. Toolbox with additional functions including GIF Maker, Video Compressor, Fix Media Metadata, DVD Copy, and others. Supported OS: Mac OS X 10.14 (Mojave), 10.13, 10.12, 10.11, 10.10, 10.9, 10.8, 10.7, 10.6, Windows 10 (32 bit & 64 bit), 8, 7, 2003, XP, Vista. 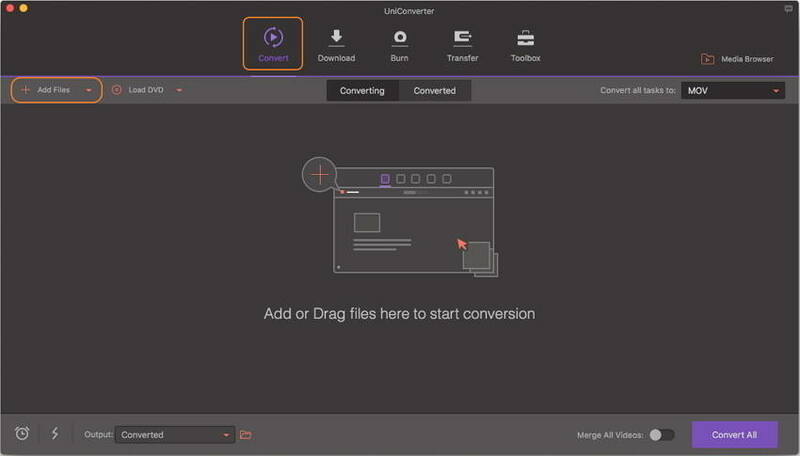 Before the conversion process beginning, you should first download and install Wondershare UniConverter (originally Wondershare Video Converter Ultimate) on your Mac/Windows. Then you can follow the steps below to convert M4V to MP4 on Mac and vice versa, the steps also work on Windows version. Launch Wondershare M4V to MP4 converter on your Mac, you'll come to the default interface which under the Convert tab. On the main interface of the software, click the Add Files button and browse for desired M4V files on your Mac system. You can even drag and drop the files to the software interface. Once you have added the M4V files to the software interface, click the Convert all tasks to: option to open the drop-down formats list, and select MP4 and a resolution from the Video section. You can edit the video with trimming, cropping, rotating, and more by clicking on the edit icons under the video thumbnail. After all settings are finished, click the Convert All button on the right-bottom corner to initiate the M4V to MP4 conversion on Mac. You can find the converted MP4 files from the Converted tab. Wondershare UniConverter (originally Wondershare Video Converter Ultimate) is paid software that is perfect for professional use when you have to convert a large number of files from time to time. If you have only a few small files then opting for a free online tool will prove to be a better option. 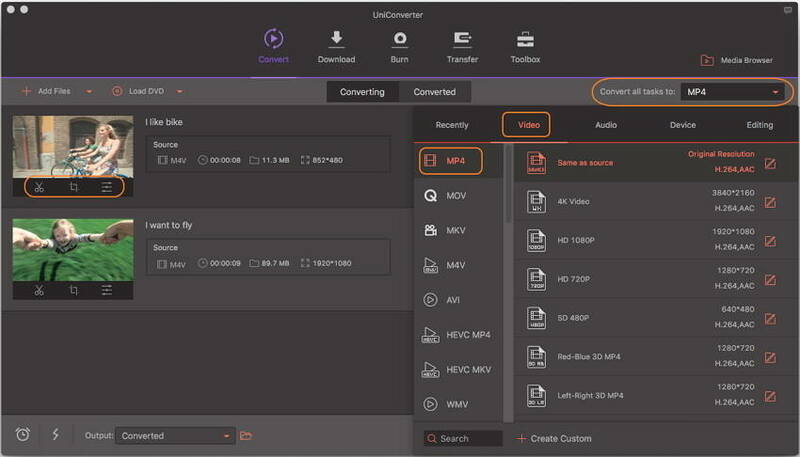 Online UniConverter (originally Media.io) is one such online M4V to MP4 converter that allows converting files at a decent speed without installing any software. The program supports all major input and output formats and the converted file can be directly downloaded to your computer. Step 1: Open https://www.media.io/ on your Mac browser. Step 2: Click Drag & Drop or Hit to Add File button to load your desired M4V file on Mac, you can add no more than 2 files once a time. Step 3: Select the MP4 as your output format from the Convert all files to drop-down list. Step 4: Finally, click on the CONVERT button to start converting M4V to MP4 online and free. After the conversion process, you can download the converted MP4 file to your computer or save it to Dropbox as you wish. 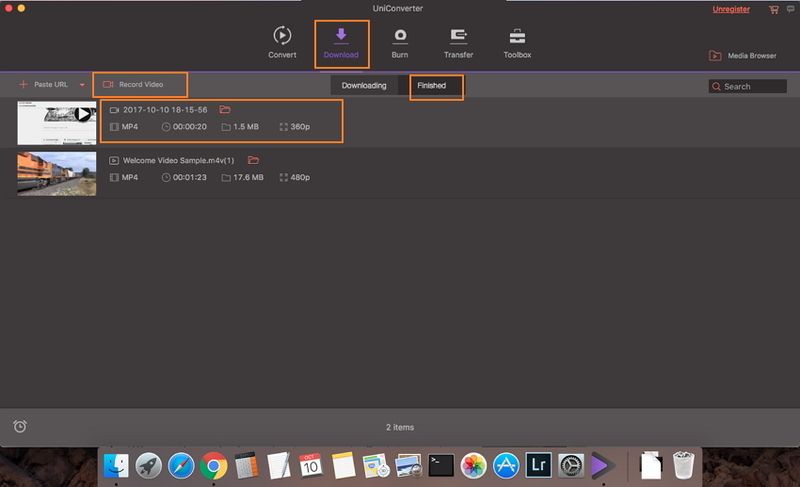 Step 1: Open desired M4V video file on your Mac browser and copy its URL. 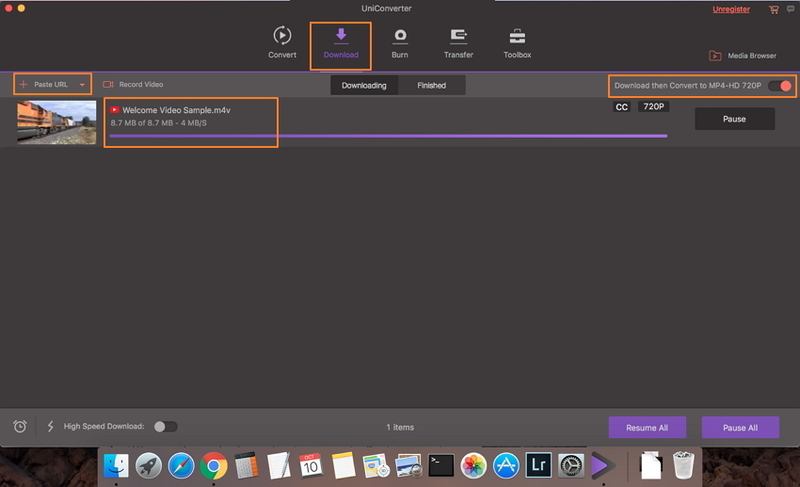 Step 2: Download, install and launch Wondershare Video Converter for Mac. Step 3: On the main software interface, select Download tab, enable the switch Download then Convert and select MP4 as the output format. Step 4: Click +Paste URL and the copied YouTube link will be automatically pasted to start the download process. Once downloaded, the video will automatically start converting to MP4 format and can be accessed from the Finished tab. Step 1: Open Wondershare Video Converter for Mac. On the main interface, select Record Video option from the Download tab. Step 2: Open the desired M4V video that you want to record. Step 3: A screen recorder window will pop-up from where you need to adjust the recording frame. Step 4: Click REC button to start the record. To stop the record, click the Stop icon on the recording task bar. Step 5: The recorded video will appear on the Wondershare interface as MP4 file under the Finished tab. Thus with the above steps you can convert M4V to MP4 on Mac, select one method as your needs. Going by definition, M4V is a video format that is developed by Apple to encode videos, movies, and other content in its iTunes store. The format is often copy protected through FairPlay DRM copyright protection. MP4 on the other hand stands for MPEG-4 Part 14 and is a universal and one of the most widely used video container formats that stores video, audio, images, and subtitles. 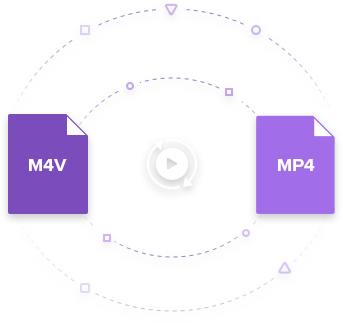 M4V and MP4 are similar in many ways, but there are many differences as between the 2 formats. Here list some differences between MP4 and M4V. Developed by Apple as copyright protected format to prevent transferring of files without paying for the content. Encourages the users to purchase files through iTunes store. Developed as a universal format that can be played on all types of players and devices. Specially designed for Apple products and compatible with iOS devices like iPhone, iPad, Mac, and others. Can be played on almost all players and devices. Restricted by Apple FairPlay DRM copyright protection. No copyright protection or restriction on use. Popular with Apple products like iPhone, Mac, iPad, and others. Popularly used for sharing, streaming, and uploading media over the Internet. The article above discusses various methods for converting M4V to MP4 format. Though you can pick up the most relevant solution as per your requirements, but considering overall features and functions, Wondershare UniConverter for Mac (originally Wondershare Video Converter Ultimate for Mac) proves to be the best M4V to MP4 Mac converter. 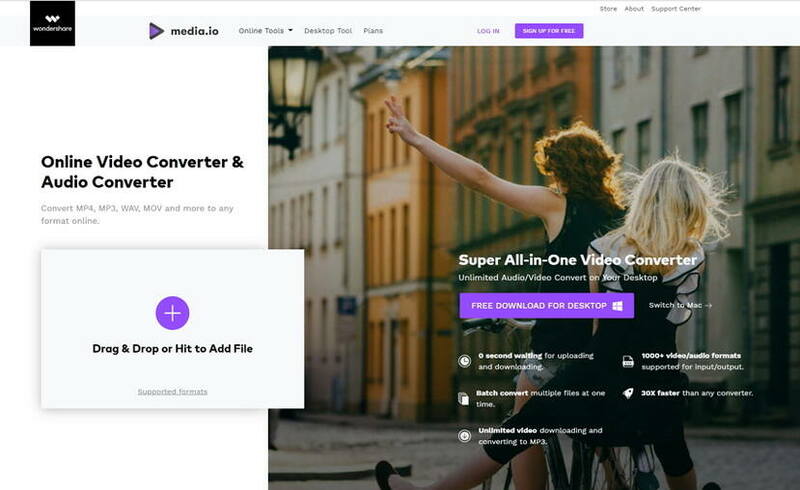 The software not only allows lossless quality conversion at fast speed but also supports video editing, downloading, recording with a host of other added features. The table illustrated below will compare Wondershare software with its free version and online program. Editing features Support a wide range of features including cropping, trimming, adding subtitle, and others. Support basic editing features. Basic editing functions like frame rate, resolution, and bit rate. Video download Allows downloading videos from more than 10,000 sites. Allows downloading from YouTube. No download feature. Thus considering the simplicity, interface, speed, and other features, it can be concluded that Wondershare UniConverter for Mac (originally Wondershare Video Converter Ultimate for Mac) is the best M4V To MP4 Mac Converter.